I can never get enough Mexican food. I don’t know what it is about it, but the flavors to me are heavenly. Probably because most recipes have so many calories. I seem to gravitate to things that are sweet, starchy or in some way calorie laden and horribly bad for me. About the only thing redeeming in this recipe (other than the fact it is very good) is the fiber in the refried beans and the lettuce I put on top (that counts as a vegetable, right?) So, I know I have to eat these favorite dishes sparingly although I don’t always adhere to my own admonitions. Brown ground beef in a skillet with chopped onion. Drain grease. Add taco seasoning and water (according to directions on packet). 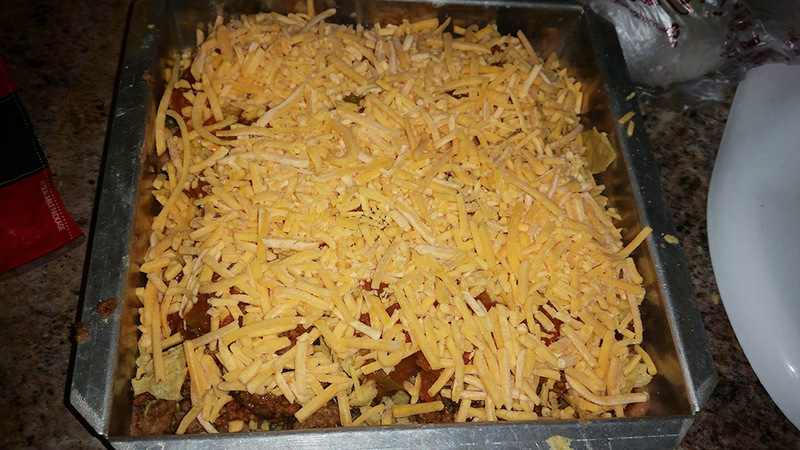 Layer refried beans in an oven safe pan (I used a 9″ square cake pan). Crush tortilla chips and sprinkle on top beans to form a layer. 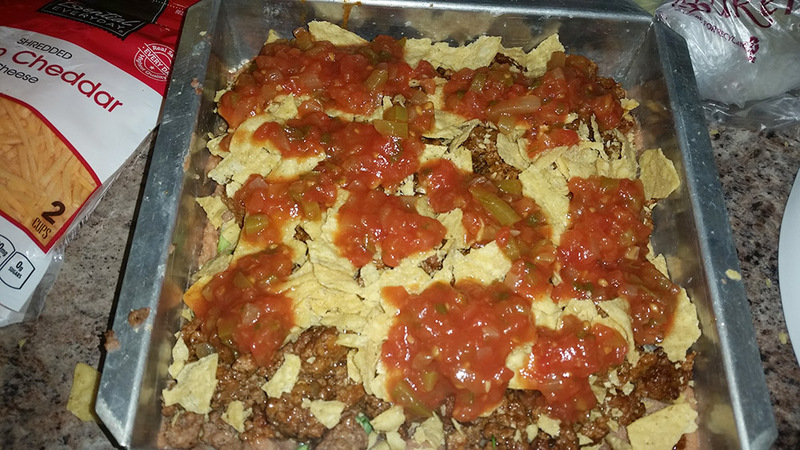 Add chopped green onions, taco meat, another layer of crushed tortilla chips and salsa. Top with shredded cheddar cheese. Bake at 350° for about 20 minutes. 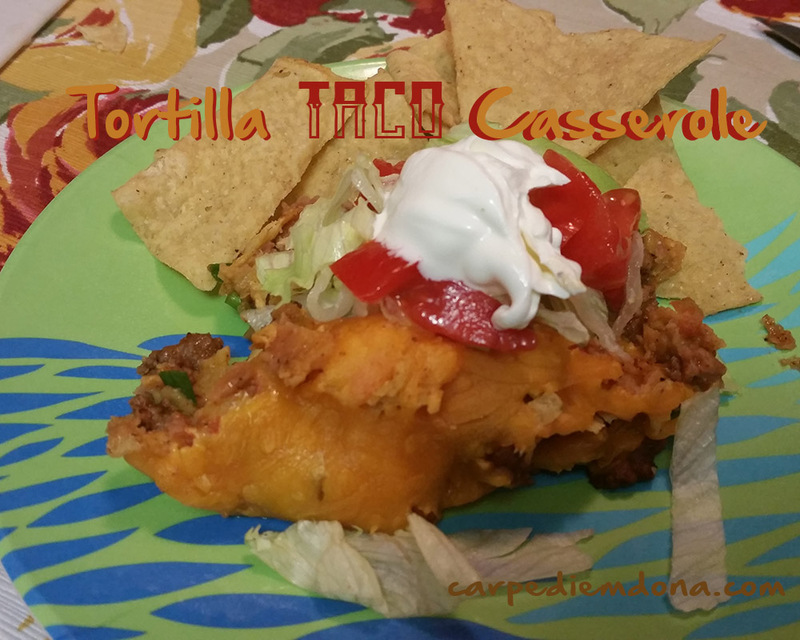 Serve with shredded lettuce and sour cream or your favorite taco toppings and additional tortilla chips, if desired. If you are calorie conscious, there are a number of ways to cut the calories in this recipe if you’d like. You can substitute ground turkey or ground venison for the beef and low fat refried beans for regular beans. You can also use low fat cheese and reduce the amount of cheese used. I didn’t use the full 2 cups and I found the recipe was plenty cheesy.